Rhinoplasty surgeons use the same surgical techniques on both women and men. But while the techniques themselves are the same — trimming or adding cartilage and bone, special incisions and suturing techniques, grafting — they may be used differently in order to achieve a more feminine or masculine look. Traits often cited as ideal characteristics of the female face include voluminous lips, wide set eyes, long eyelashes, and a relatively small, upward-tilted nose, among others. One study has suggested that the angle between the nose and face of a woman with an ideal female nose is 106 degrees. Feminine-looking noses are usually more refined and narrow; have a soft, rounded tip; and are typically less prominent than the ideal male nose. 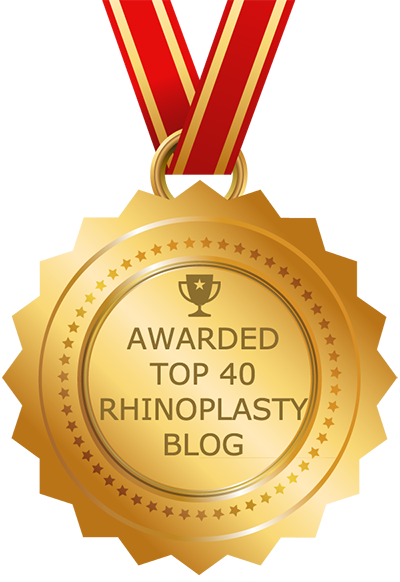 Rhinoplasty surgeons always have these factors in mind when performing female rhinoplasty, and the techniques they employ will reflect this. The goal of both female rhinoplasty and male rhinoplasty surgeries is to sculpt the patient’s nose so that it is in harmony with the other features of the patient’s face. For all intents and purposes, most aspects of female nose surgery and male nose surgery are the same, but with slightly different goals, because certain features are considered more feminine and others more masculine. For example, a large, angular nose often looks too masculine and unbalanced on a woman, as does a nasoglabellar region (the area where the forehead meets the nose) that is curved in a way that appears masculine. Thus, if a woman’s nose has these characteristics, techniques will be employed to correct them — the goal being a more refined nasal appearance. Other than these gender-specific considerations, the goals remain the same: to create beauty and symmetry as well as harmony with other facial features. The most common techniques in female rhinoplasty are those employed to refine the nasal tip and narrow the nose. Since female rhinoplasty often involves feminizing the tip, techniques may be performed to remove tip cartilage, correct upturning of the nasal tip or elevate the tip. Usually, the procedure actually involves a combination of techniques, including cartilage removal and suturing techniques and/or cartilage grafts to achieve elevation or rotate, enlarge or narrow the tip. In many cases, the problem is a bulbous tip. The goal in this case is to give it a more triangular shape. The lower lateral cartilages have a huge impact on the appearance of the tip’s shape. Therefore, female nasal tip techniques often focus on refining these cartilages in order to shape the tip. The cartilages may be narrowed, flattened, reshaped, and/or brought together with dome-binding sutures. The sutures are often placed both above and beneath the tip. There are also many techniques commonly used to address complaints that are common in both men as well as women, such as a nose that is crooked, big, twisted, asymmetric or too long. Female rhinoplasty can also address issues stemming from previous rhinoplasty procedures, such as nasal collapse or over-resection. For functional purposes, female rhinoplasty may be performed to address structural problems that affect breathing or cause congestion, such as nasal valve collapse. If you are ready to begin your search for a surgeon to perform your female rhinoplasty, a good place to start is the website of the American Academy of Facial Plastic and Reconstructive Surgery (AAFPRS). There you can find a board certified facial plastic surgeon with advanced training in rhinoplasty procedures. Ideally, you should try to locate a surgeon that is also board certified in otolaryngology (ear, nose and throat surgery). This is the best way to ensure you achieve optimal aesthetic as well as functional results. Double board certified facial plastic surgeons have advanced training in all types of rhinoplasty, including female rhinoplasty. They have an in-depth understanding of the internal structures of the nose as well as the external aesthetic appearance, and they know how to properly alter each, as needed, to achieve the results you are looking for. They are also trained to handle functional issues such as breathing problems.